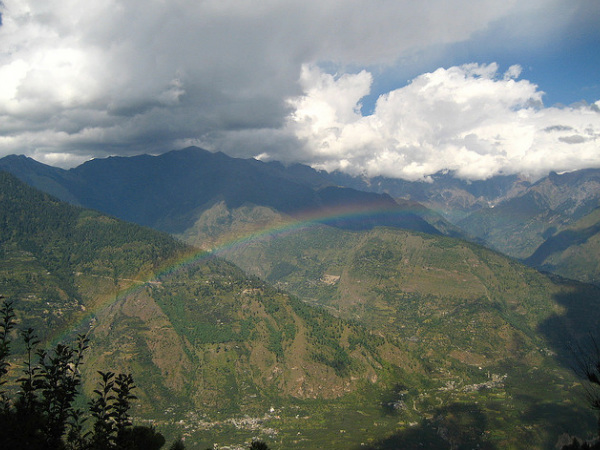 Naggar is a prominent tourist destination situated in the Kullu Valley in Himachal Pradesh. It is an ancient town and the oldest capital of Kullu with naturalistic views, especially to the North West of the valley. The place was founded by King Visudhpal after which it continued as the state headquarters until King Jagat Singh transferred it to Sultanpur, now Kullu, in 1460 A.D. There are numerous sightseeing attractions in Naggar of which the most popular destination is the Naggar Castle. Travellers coming here are left in awe by the beauty of this scenic town. Here is a guide to the town of Naggar. Click Here for the Best Hotel Deals in Naggar. Naggar Castle, an ancient royal fort built about 500 years ago, is a popular destination among tourists, located at a short distance of 21 km from Manali. This medieval castle was built by Raja Sidh Singh of Kullu sometime in 1460 A.D. The structure showcases a beautiful blend of stone and wood in its architecture. Sprawled near the Beas River, the castle features a picturesque riverside view. The Reorich gallery, displaying the works of renounced Russian painter, Nicholas Reorich, is an added attraction of the castle. The beauty of the castle lead to it being chosen as a backdrop for a song for a Bollywood blockbuster 'Jab we Met'. View of the Naggar Castle. Muralidhar Temple, one of the most popular tourist destinations located at Naggar, is known for its architectural style which is similar to that of the pyramids of Egypt. The temple enshrines idols of the Hindu deity Krishna and his beloved Radha. Built during the medieval period, the idols of the temple have been receiving royal patronage for a long time. Chamunda Bhagwati Temple, located at the village of Nishala, 4 km from Naggar, is dedicated to Chamunda Bhagwati. The goddess is considered to be one of the seven 'Matrikas' or mother goddesses. She is also known as one of the chief Yoginis, a group of sixty-four or eighty-one tantric goddesses, who are attendants of the warrior goddess Durga. The name, Chamunda is a combination of Chanda and Munda, two monsters who Chamunda killed.The area where the temple is located is a popular site for Bollywood film shootings because of its picturesque surroundings. A devotee at the temple. Jagatipatt Temple is a significant attraction of Naggar, located in the Naggar Castle. According to folklore, gods and goddess transformed themselves into honey bees and cut a slab of stone from the Bhrigu Tung Peak and brought it to the temple in order to make Naggar a divine place. Locals also believe that the deities gather here to protect the people from calamities. The temple is small and square shaped; enshrining a slab of stone called the "Jagatipatt". The wooden structure of the temple exclusively represents the architectural style of Himachal Pradesh. Beside this, alternate slabs of stones and deodar timbers are used in the temple structure making it earthquake proof. Devotees throng this temple to seek the blessings of the gods. Travellers coming here can admire the beauty of the architecture of the temple. By Air: Bhuntar, located at a distance of approximately 32 km from the town of Naggar, is the nearest airport to the place. Regular flights from the cities of Chandigarh and Delhi connect the place to the rest of the country. By Train: The nearest railway station to Naggar is the Kiratpur Sahib Railway Station, a narrow gauge train line, which is situated at a distance of 205 km from Kullu. It is well connecte dto the rest of the country from here. By Road: Naggar, situated 25 km to the northeast of Kullu and 21 km to the southeast of Manali is well connected with good roads to other regions of the state of Himachal Pradesh. Bus services are available from Naggar connecting neighbouring towns and cities. So when are you heading to Naggar?